I know there are a lot of box subscriptions out there. 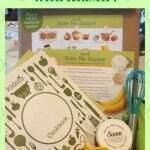 You can get themed boxes with themes ranging from health, to children’s products to food. I was lucky enough to get a box from Little Pnuts to review, and I must say, this has to be one of my favorites. 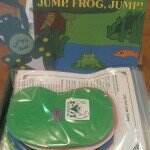 The products I received in the Little Pnuts box were all high quality toys and age appropriate for my son. But my 3 year old enjoyed the toys as well! Also, these were mostly toys I would have picked out myself (if I’d known about them). 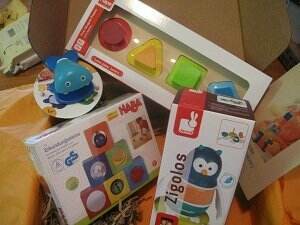 For some reason I like wooden toys, and these were all wooden toys from companies like Hape, Haba and Janod. 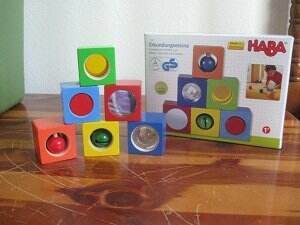 First Shapes Puzzle by Hape–This is a simple shape matching “puzzle” containing four individual shape pieces with large “knobs” perfect for little hands. This helps with dexterity and hand-eye coordination. Haba Discovery Blocks–These six little blocks are colorful, but each one has a little something “extra” such as a mirror, bell or kaleidoscope. Perfect for sensory exploration! Fish Castanet by Plan Toys–This is a sort of musical instrument that makes a “clapping” sound. It is a little difficult for a one year old to do one-handed, but helps promote motor skills. 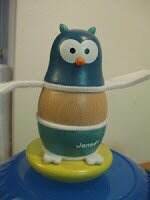 Owl Stacker and Rocker by Janod–This owl shaped stacking toy is probably the favorite of both my kids. Which is unfortunate in a way, because they try to fight over it. This is a fun spin on the traditional ring stacker that contains 3 wood sections (besides the base) and 3 felt pieces (feet, tail and wings). My one year old loves threading the pieces onto the base! Little Pnuts offers three levels of special delivery subscriptions. The infant box is for babies up to one year old, the toddler box is for toddlers 1-3 and the preschool box is for children 3-5. There are also “special occasion” add ons available, for things like holidays birthdays, or just because. 🙂 Choose your Little Pnuts box here! Little Pnuts was created by a mom of 2 who was on a mission to find toys that were organic, ecologically friendly, handmade, made of natural materials and sustainably made. Such toys were more readily available in Europe than in the US, and she wanted to change that, so Little Pnuts was created. Please note that Little Pnuts is a quarterly subscription, which means you will get four boxes a year. The next shipment is scheduled for June and orders must be received by May 15 to get the June box! Be sure to check out the Little Pnuts website and feel free to follow them on facebook, twitter and Pinterest as well, for lots more fun ideas for your Little Pnuts!